Today, a lot of us come from religion where we’re the ones who are supposed to do it, and if we do it we get a reward. But see with the first century people, they knew all about somebody taking their place. Because they understood it so well there were no more need for shed blood. The blood was already shed. There was no more need to kill a lamb. The lamb had already been slain. This is what they couldn’t understand. When all of a sudden the Apostle Paul said something very foreign to their thinking. He’s telling them now—their life has to become the sacrifice. In view of God’s mercy. More than a yearly trip to the temple. More than mechanical religious duty. Now they’re the anointed priests of God. Often times we hear that we are priests. You are royal priests, a holy nation, God’s very own possession. As a result, you can show others the goodness of God, for he called you out of the darkness into his wonderful light (1 Peter 2:9, NLT). 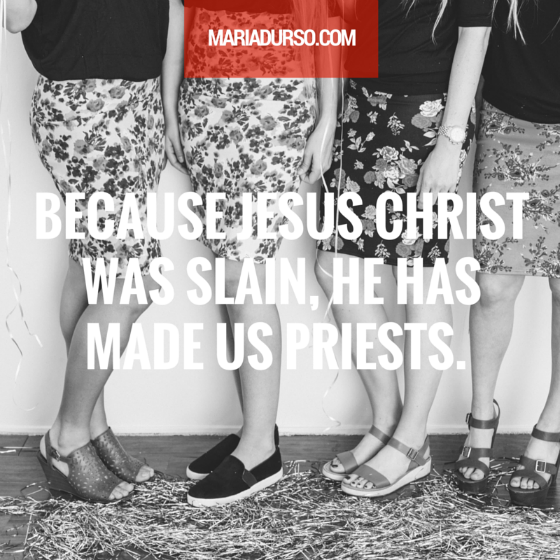 Because Jesus Christ was slain, He has made us priests. Male or female has nothing to do with it! We now become priests. The High Priest has now handed us the baton to become priests. Now we can go to God without somebody going to God for us. Now we can proclaim the glorious riches of the one who saved us. Now we can go and pray for somebody else. The first century believers couldn’t understand this. This now became very personal. Personal and costly. Were they hearing Paul correctly? They were to become priests and the offering too… How invasive & absurd! Their Savior, Jesus Christ not only the became the priest but He also became the offering. Now because they are the seed of Christ, they also became priests and their bodies, their very being, became the offering. This was their reasonable act of worship. The Apostle Paul is saying in view of God’s mercy, worship takes on a whole new meaning. It’s no longer about going to the temple once a year, or going to the worship service on Sunday. It’s so much more than that. No! Every single a part of you is worship. When you’re home in the car with your children. When you’re making love to your husband. When you’re serving in the ministry. When you’re speaking to the coworker. When you’re on the job. Listen! In view of God’s mercy, offer your bodies. Offer every single part of you. There’s no compartmentalized religion any longer. Question: Do you consider yourself a priest or is that foreign thinking to you?